Patholi is a traditional Indian Sweet prepared with Haldi ( Turmeric) leaves. Its prepared mainly during the festivals like Gowri- Ganesh Festival and Nagarpanchami Festival. 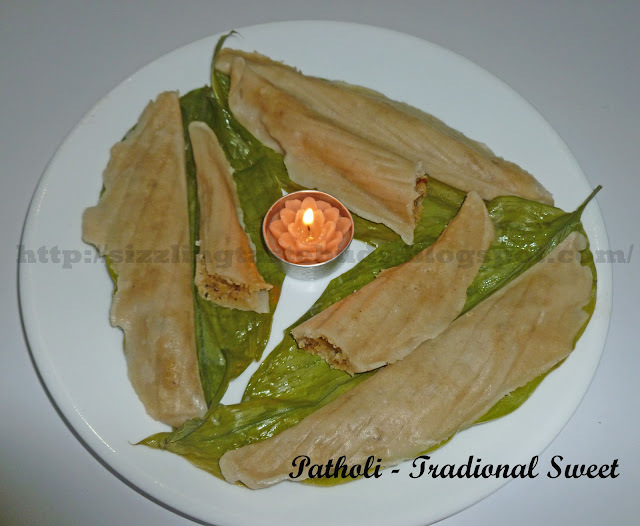 And today I am posting this recipe because its the 5th day of Shravan and the first festival of this auspicious month is Nagarpanchami. Haldi leaves is called Arashina yele in Kannada and its botantical name is Curcuma. I have these lovely aromatic leaves in my backyard. 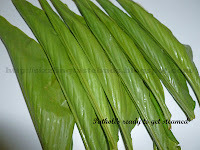 These leaves are most popular in Konkan coastal areas and its used in lot of other dishes too. 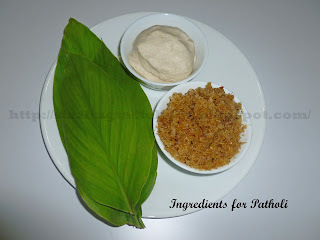 Mix grated coconut and jaggery in kadai and fry it till the jaggery melts and gets mixed well with coconut and the mixture turns golden brown in color. Add Cardamon powder, mix again and keep aside to cool it down. Mix 1 cup of rice flour, 1 tbsp wheat flour and Salt to taste. Knead it into a soft dough by pouring enough water. Keep aside. 1. Wash the leaves and pat it dry with a clean cloth. 2. 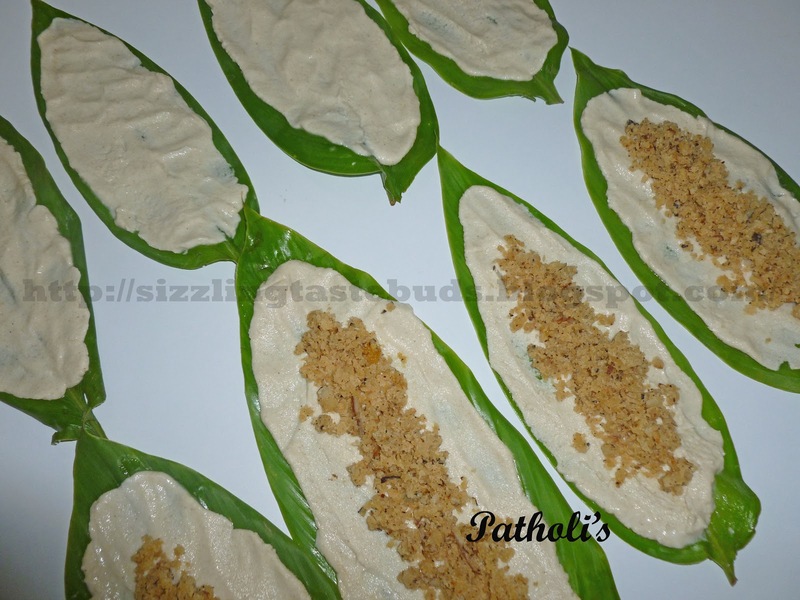 Take a lemon sized rice dough and spread it evenly on the leaves. Patholi tastes better when this layer is thin. So spread the mixture as thin as possible. Dip your fingers in water while spreading the dough on leaves so that it doesn't stick to your hands and you get to have a thin layer. 3. Take a spoonful of coconut and jaggery mixture and spread it in the centre along the midrib of the leaf as shown in the picture. 4. Fold the leaf and slightly press the edges so that the stuffing stays neat and doesnot come out. 5. Proceed with the same method for rest of the leaves. If you find this difficult try out this method. Spread the rice flour on two separate same sized Haldi leaves. 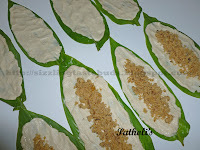 Spread the sweet mixture on one of the leaf and cover it with the other leaf. The shape might get changed but the taste still will be the same. 6. Steam it for 8- 10 mins and serve it hot with Ghee/ Clarified butter. Remove the leaves just before having it and enjoy the sweet kadabu. Try it out and let me know how it tasted.